In Misadventures: Finding Magic In Mishap, a bi-monthly Choose Mountains Blog Post, Allison (@liveuntethered) shares stories of falter. When we try to fly, we’re going to fall. And when we venture somewhere new, we’re going to take wrong turns. Let’s embrace it! My love and respect for the outdoors has followed a pattern of venturing further and further into territories about which I’m unfamiliar, uncertain and honestly, a little afraid. I was never a Boy Scout, I was never a huge outdoor nut growing up. I went on hikes with my family, I was a proud member of the Choctawhatchee Indian Guides tribe at the YMCA, and I hosted a few camping trips in my backyard. When my grandfather passed away two years after my college graduation, I found solace in the wilderness. I decided I wanted to show my love for him and honor his life, so I undertook a 25 mile hike in a day out near Harper’s Ferry, West Virginia. While menial to the experienced hiker, it pushed me to a limit I had not yet endured and it exposed the beauty and benefits of nature. 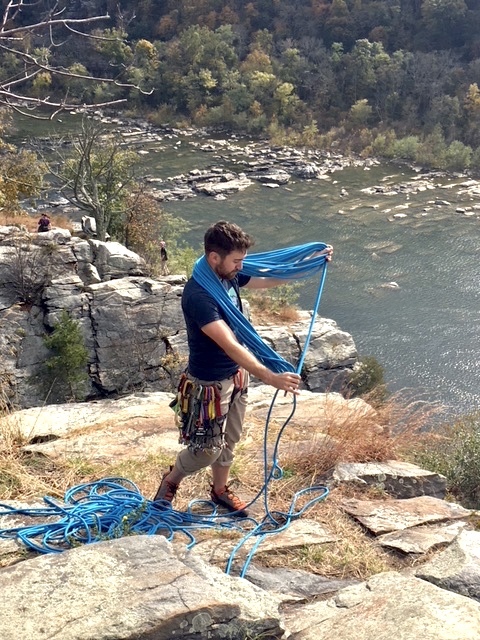 Three years, almost to the day, later, I returned to Harper’s Ferry, and led my first rock climb on the Maryland Heights Sign Wall, steps from where I first set off into the natural world what seems like an eternity ago. In the last three years, I’ve stood on 20,000 foot mountains in Ecuador, driven across the vast playground of Iceland, played with grizzly bears in Grand Teton National Park, boarded a brush plane and solo hiked across sections of the Wrangell-St Elias wilderness and taken far more chances of which my mother would approve. 11 months ago, I decided I wanted a new challenge. I live in Washington, DC, so backcountry skiing was probably out. High alpine mountaineering was fun, but the highest mountain within three hours of DC tops out at 3,000 feet. So, I settled on rock climbing. I bought a harness and helmet at REI, and asked for money to join my climbing gym for my Christmas presents. In February, I climbed in Joshua Tree with Ryan. Then in April, I climbed in Zion. May, I climbed with Ryan again in Acadia. In late July I went to the Bugaboos with Alex. Then I visited Paul and Laura in Smith Rock. September- Yosemite. Early October was a rock climbing course at Seneca Rocks, where I learned how to place gear, build anchors and lead. Then it was Red Rock Canyon on the longest route I had ever done with Lindsey. 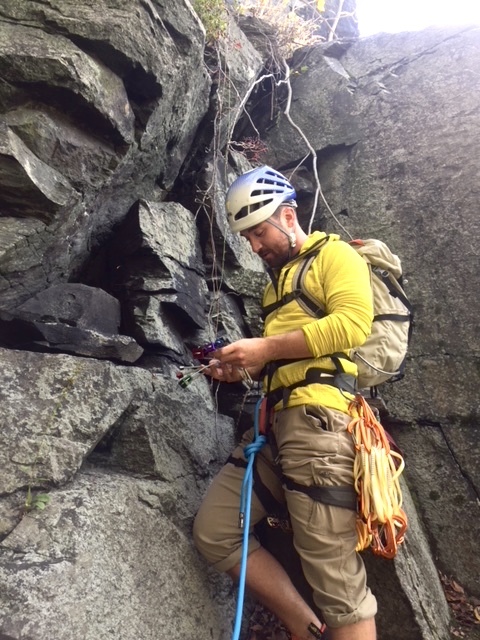 Two weeks and lots of dividend earning purchases from REI later, I stood at the base of a multi-pitch route at Maryland’s highest rock wall. I checked my gear alignment on my harness and started upwards into the unknown. Most people who climb would look at the route as a lighthearted warmup. Some of my guides would probably not place gear if they were on lead. For me, it was the hardest and scariest thing I had ever done in the outdoors. I legitimately fought back tears at the top of the first pitch. I wedged myself through a chimney on the second pitch and burst into hysterical laughter when I found the anchor above. It’s been less than a year since I decided I wanted to learn how to rock climb. I never would have imagined within that time I’d build up the confidence to take the sharp end. I couldn’t have done it without support all along the way. Without a non-rock blocking partner, my friends and family, my newfound guide friends across the country, and everyone in between, I wouldn’thave been able to find my first hold last weekend. I’ve got big things planned for my next steps in rock climbing, and I’m excited to share my journey with each of you.